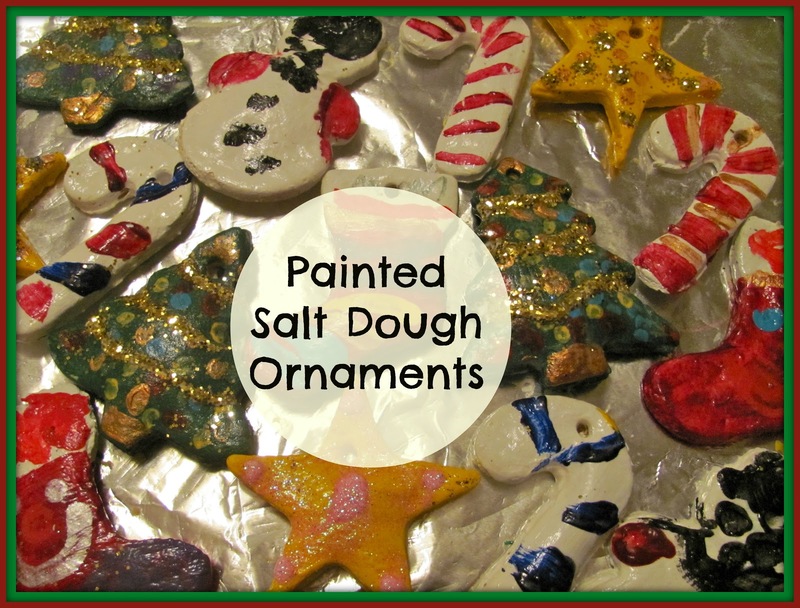 We finally finished our Painted Salt Dough Ornaments today. Some of these beauties will be going on our Christmas tree and others will become some fantastic gifts to our family and friends. It was a long process, but well worth it. We made Salt Dough Heart Necklaces back in the Springtime for Mother's Day and they made fabulous gifts. Mix the flour and salt well and add water. Add more flour if too sticky or more water if too dry. Roll out on a flour surface to about 1/4 inch thickness. Use cookie cutters to create the shapes for your ornaments and then place the dough shapes on a foil lined cookie sheet. Use a straw form holes on the top of the ornament shapes. Bake between 275 F and 300 F for 1 1/2 to 2 hours. 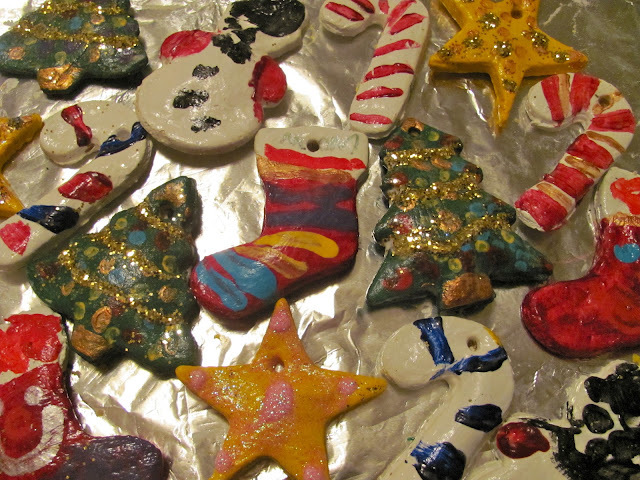 After the ornaments were done, we painted the dough shapes with solid colors of acrylic paint. Then we added more detail with gold paint and other colors. Lastly, we added some touches of glitter to add some sparkle which is always fun! Next, we'll be adding some ribbon for hanging. What have you been making with your children for the Holiday season? They turned out beautifully - this is probably what we will do next year for the family ornaments! Thanks! They are going to be gifts. how do you know when they are ready?? another question: I made homemade play dough, similar to your recipe. I wonder if I could use it and bake it?? Hi Tereza, I kept them in for the 2 hours, but it may depend on the size of the ornaments. If the ornaments are smaller I would say less time. You could try baking the play dough, but I have never heard of a play dough recipe that you can bake? How many ornaments can you make out of this recipe (1 c flour, 1/4 c salt, etc.)? Sounds like a great class project, in which case I'd need dough for 24. I would say double this recipe and it will just make about 24 small cookie cutter size ornaments. If you want more then triple it. Good luck!